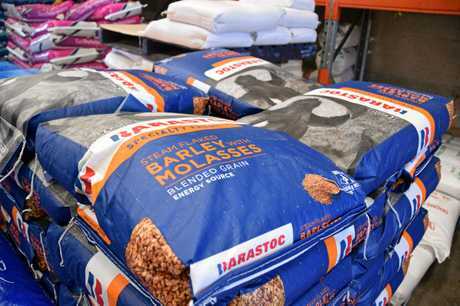 AGRICULTURAL supplies business Rocky Feed and Seed says it is going through 40 tonnes of lick each week as the drought bites. It is a stark comparison to last year's winter when they were lucky to go through one tonne, demonstrating how dry Central Queensland is now. The business has been locally owned for 14 years by brothers Todd and John Lynch, who hail from the St Lawrence area. 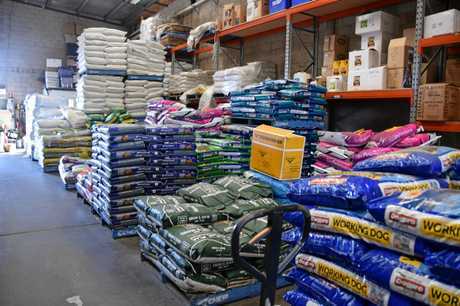 It sells a big range of agricultural products from horse, dog, chook and cattle feed, animal equipment, accessories, cages, care and medicinal products, and a variety of nutritional supplements. "We love it, dealing with country people all the time,” Todd said. 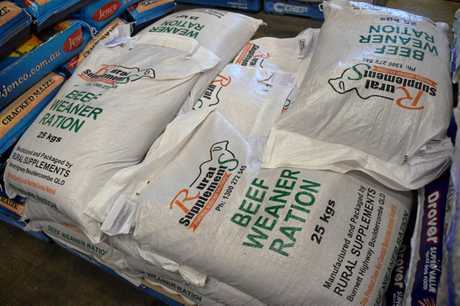 Their business is booming at the moment as drought-stricken farmers are flying through the doors to buy lick, hay and protein to feed cattle. The struggle Todd is facing now is finding good quality hay. 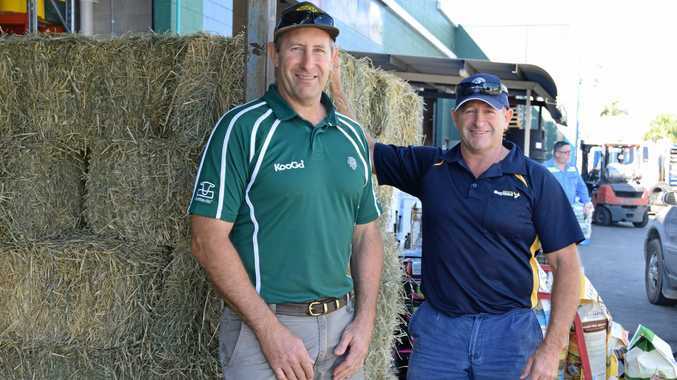 They source their hay locally from Biloela but their suppliers stock is getting low. "You are waiting on the next cut and you only need a shower of rain on that which could put it back another cut and then it is a month,” Todd said. "Our quality is still really good, we have had the same suppliers for years. "We know we get good hay from them and we are pretty loyal people. The issue is mostly the uncertainty - how dry it will be for the next couple of months and when they will be able to get their next order. "People are saying this is the last cut and it will be a few weeks,” Todd said. But a few weeks can make the world of difference for farmers and their animals, he said. "Farmers can't go a couple of weeks without a couple of bales of hay,” Todd said. Cottonseed and copra meal is very popular as they provide much-needed nutrients for the animals. Todd said all of these protein meals are "getting very scarce and almost impossible to get now”. "The dry lick and block situation is the one that is going to hurt the farmers,” he said. Orders for lick and block have a wait of around two to three weeks. "But farmers or their cattle can't wait that long,” Todd said. The products are sourced from manufacturers - mostly in Townsville - but it also comes from Maryborough and Brisbane. The suppliers are having trouble keeping up with the demand of large orders. "Their plant is only set up to make a certain amount and in the wet times, it is sitting there doing nothing,” Todd said. "It has put pressure on the stock they had made and they hadn't catered for that many for this long. At the moment, Todd is placing orders of 40 tonnes of lick a week. "Last winter was really quiet in the lick, we just got little showers to keep the grass growing,” Todd said. As some products can't be sourced, it has meant some customers have had to rethink their feeding processes. "Even at the moment we are having to swap people off onto another thing because we don't have that one,” Todd said. This year, the drought started really early in the season, Todd said. Farmers had to start feeding their cattle earlier and it has just kept going from there. As business owners, it is hard for John and Todd to work out what the season will be like when they order ahead. "That is our hardest job, predicting every year how much to have sitting on the floor,” Todd said. Wet years are few and far between in Central Queensland and this year is certainly a dry one. Grass cover is the biggest problem - the fact that there just isn't any. 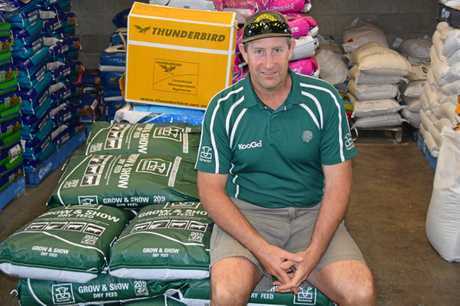 "Normally this time of year you still have a body of grass and you can feed a bit of lick and utilise that grass,” Todd said. Todd sees customers come in from all over the region, from down to Miriam Vale, out to Alpha, around Biloela and up to St Lawrence and Clairview. Todd says around Rockhampton is the worse-affected area in drought. "Around Alton Downs, out Ridgelands way, down to Biloela and Wowan way is really bad,” he said. But the drought is affecting the whole state, including the whole of New South Wales being drought declared. "Everyone is struggling, it's not isolated, it is so widespread,” Todd said. Cattle prices also haven't been kind to customers, Todd has heard. A lot of farmers destocked early to cash in on good prices. For those who haven't destocked, it isn't good news. "Now they will have to ride it out because the prices are dropping,” Todd said. Feeling for those who are doing it tough, Todd said he hopes to see rain soon. With all of the extra produce he is selling, the dry is making good profits for his business but he said he does feel guilty. At the end of the day, they are offering a service to help farmers. "And if we didn't do it, someone else would,” Todd said. "At least we have something to sell at the moment, it's when we don't have something to pass onto them is when the issues are starting."